← Is a Bomb Shelter in Washington Square Park Public Art or a Public Protest? 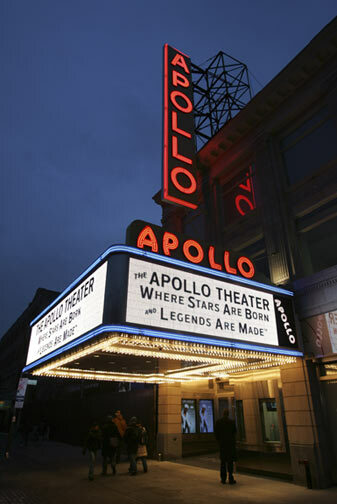 New York City’s Apollo Theater made the news in recent years mainly for holding such events as Michael Jackson’s and James Brown’s memorial services, or Obama’s fundraiser in 2007. There’s was a time though when The Apollo was a symbol for black American culture that changed for good popular-music in the 20th Century. “Ain’t Nothing Like the Real Thing: How the Apollo Theater Shaped American Entertainment” is the title of an exhibition created by the National Museum of African American History and Culture to celebrate the theater’s 75th anniversary and its rich cultural heritage. After being showed in Washington and Chicago, it has finally hit “home” and it’s currently hosted by the Museum of the City of New York in Spanish Harlem. The exhibit consists mainly of a series of chronological panels and photographs telling the story of the Apollo and linking it to Harlem’s evolution during the last century. It’s surprising to learn that The Apollo started as a segregated burlesque venue devoted to vaudeville style performances. It all changed though in 1934 when the theater was bought by Frank Schiffman, a white Jewish promoter and big fan of what was known back then as “race” music. Around that same time, a movement named the Harlem Renaissance began a cultural, artistic and musical boom in the area, which The Apollo took a huge advantage of introducing a performance contest called Amateur Night. The most impressive panel in the exhibition is precisely the one that includes the list of winners of Amateur night: Ella Fitzgerald, Billie Holiday, the Isley Brothers, Jimi Hendrix, the Jackson 5 or Gladys Knight are among them. Other big names that owe much of their careers to The Apollo are Ray Charles, James Brown, Marvin Gaye, Stevie Wonder, Diana Ross, Aretha Franklin and Mariah Carey. The visit to the museum could be complemented with a visit to the actual Apollo, that will host again Amateur Night starting April 6. Things have not changed much in this mythical avenue’s main event, except that Ella Fitzgerald won $25 in its first edition and now the winners can take home $10,000. “Ain’t Nothing Like the Real Thing: How the Apollo Theater Shaped American Entertainment” is on view through May 1 at the Museum of the City of New York, 1220 Fifth Avenue; $10 adults, $10 students, seniors; mcny.org. Thank you so much for giving everyone a very wonderful opportunity to read from this web site. It is usually very kind and also stuffed with amusement for me personally and my office fellow workers to search your web site no less than 3 times a week to study the latest items you have. Of course, I am also certainly fulfilled with your striking ideas you serve. Certain 2 tips in this posting are basically the most impressive I have had. I am just writing to let you know of the magnificent encounter my child gained reading your site. She even learned a wide variety of pieces, not to mention what it’s like to possess a very effective helping mindset to make many more without difficulty have an understanding of certain hard to do topics. You actually exceeded my expected results. I appreciate you for coming up with those interesting, healthy, revealing and as well as cool tips about this topic to Jane.